Well, our buying a car is not really an important part of the world’s economic problems, but like most Americans, we have been mostly unconcerned about the cost of operating automobiles, both in an economic and an environmental sense1. In our defense2, our small town of Pella has no public transportation within the city or to outlying cities where one might want to shop or attend a movie, etc. Cars are about the only way to meet transportation needs. But, in the past few years the price of gasoline nearly doubled, alternative fuels3 have been developed, service, tires and repairs for cars have increased greatly, and we all have been urged to help solve environmental problems which are, to a great extent, due to emissions4 from automobile, truck and bus engines. Until recently we had three family cars even though our garage has room for only two. We have three adult drivers, only one of whom needs transportation to work each day. Last year we began to consider ways in which we could reduce our car expenses and concurrently6 be more environmentally involved. We decided it was time to give up one car and do what was possible to aid environmental situations. Our oldest car was 13 years old, the 2nd was 7 years old, and our newest one was 3 years old. Our logic7 was that we should either sell or trade8 the oldest car because of its high mileage, and we should keep our 7-year old car because it had the lowest mileage of the three, was a bit smaller and easier to park for local use. Our newest car would probably bring a fair price if traded. As it happened, we could more easily trade two cars in for a newer car than we could sell or trade either of them separately. Especially at times of economic recession9, neither the car dealers nor the car owners want to lose money on a trade or purchase, so there is an understandable bargaining process10 whenever a sale is considered. We have learned over the years to welcome this bargaining. It involves not only the potential buyer and the one dealer, but also dealers competing with other dealers, as well as with the buyer. In some ways there is an advantage in buying from one’s local dealer, because it is easier to arrange for servicing and repair without driving to a more distant dealer. It is also a good idea to support local businessmen if one hopes that they in turn11 will support community activities in which we all are interested, i.e. schools, recreational and sports activities etc. In our specific case, the bargaining process took several hours and the final result was that we received what we felt was a fair trade-in12 price for our two cars; the dealer felt that we had been reasonable in our suggestions, and we agreed to buy a 2008 model which has the “Flexfuel” type engine13. Because of the current interest in developing ethanol14 as a less-polluting fuel, the state of Iowa subsidizes15 ethanol/gas mixtures which a flexfuel engine can use. 85% ethanol costs about $2.00/gallon, 15% ethanol costs about $3.50/gallon, and regular gasoline about $3.65/gallon. We can reduce pollution by driving our new car, can help support farmers and companies who grow corn and other crops to make ethanol, and can eliminate the cost of upkeep16 on our cars by cutting back to two cars. This will help the transition17 from gasoline to more clean-burning fuels. At the same time, the local car dealer has sold a car during an extremely difficult market situation18. It is likely true that “Flexfuel” engines and hybrid-cars19 are only transitions from current to other alternative fuels. Hydrogen fueled cars are being developed, and when these are available, drivers will finally have cars which eliminate nearly all harmful “greenhouse gases,” and have a plentiful source of energy that could be less expensive. Hydrogen is abundant20 and does not require access to21 oil supplies which are non-renewable22. Meantime, we will reduce car costs in any way we can, and that includes not using a car when a bicycle ride or walking is possible. We know that ours is only a tiny contribution to much larger environmental and financial problems, but, if everyone makes even small changes, great progress can be possible. 1. both in an economic and an environmental sense: 既从经济又从环境的角度来看. Here the word “sense” means a way of thinking about or understanding something. 3. alternative fuels: combustible sources of energy to run engines other than those derived from petroleum (非传统燃料，可替代燃料). 4. emissions: gases or other substances that are sent into the air (排放物). 6. concurrently: at the same time; with more than one thing happening at a time (同时). 7. logic: a methodological way of thinking in a reasonable way with good criteria (逻辑推理). 8. trade (in): give something old as part of the payment for something new (折价换购). 9. economic recession: a situation in which economic activity is unusually low (经济衰退). reach an agreeable price to be paid for some item or service (讨价还价过程). 11. in turn: as a result of something that is part of a connected series of events (结果，反过来). 12. trade-in: something such as a car or piece of equipment that you give as part of the payment for something new (折价物，折价品). a mixture of other fuels, in this case mixtures of ethanol (ethyl alcohol) (能使用混合燃料的发动机). 15. subsidizes: pays some of the cost of goods or services so that they can be sold to other people at a lower price (给……津贴/补贴). 16. upkeep: the process of keeping something in good condition (维护). 17. transition: a change from thing to another (过渡). 18. extremely difficult market situation: a condition of the economic situation at a given time (非常困难的市场形势). 19. hybrid-cars: cars with a part gasoline and part electrical engine (混合动力汽车). 20. abundant: available in large quantities so that there is more than enough (丰富的). 21. access to…: the right or opportunity to have or use something (对……的享用权/享用机会). 22. non-renewable: unable to be renewed (不能再生的). Today one of our errands1 will be to return pop cans and bottles2 to our city can and bottle recycling center3. We usually wait until we have one or two large plastic garbage bags4 filled with the cans and bottles, and then take them there. We need to make the trip soon. When we get to the recycling center, we have two choices as to what to do with the cans and bottles. Either we can take them inside to be counted by a worker and given back the deposit5 we paid at the super market when we purchased the drinks, or we can just leave them outside in a big box labeled “Donation6 for C.O.C. 7” This means that instead of our collecting the money for ourselves, it will go to The Christian Opportunity Center7, a special private school for handicapped8 people located here in Pella. It is always in need of extra funds9 for carrying on its work with the severely10 handicapped people it serves. Our other materials that need recycling were picked up by the city this morning after we had put the paper, tin cans, and non-redeemable11 bottles in the recycle box12 in front of our house. There has been a resurgence13 of “the battle of the bottle, part of the war on waste14.” In the 1970s in the U.S. there was interest in cleaning up the environment15 during “Earth Day16” by picking up the waste paper, cans and bottles which littered17 the roadsides nearly everywhere. Most state legislatures18 and larger city councils19 wrestled20 with the problem, and all agreed that there must be some monetary incentive21 to keep the roadsides clean, and to save both glass and metal wasted in bottles and cans. A similar problem had been solved patriotically22 during World War I and the 1940s by establishing collection centers for paper and waste metal23, letting those who wished to do so collect waste paper and metal, and be paid a small sum by the collection center when these were recycled. Any person who was in the Boy Scouts24, a school club, etc. at this time knew how this worked. With “forced labor25” and a few cents per pound paid for paper and metal, the country had a successful recycling program during that period, and the clubs and groups built a modest treasury26 for their activities. It was a win-win situation27 but in a few years, the “war effort” was no longer a valid excuse28, and groups of young people found better ways to raise money. Within a few years the “throw away society29” was again wallowing30 in its own wastes, and it became evident that a better recycling system was needed. First came city ordinances31 and state laws requiring grocery stores and other dealers in bottles and cans to collect the used containers and return them to waste collection centers. Eventually private redemption centers32 replaced the collection by grocery stores so that beverage salesmen did not have to bear the brunt33 of the work and smell! Whatever the problems, it was true that this process, while flawed34, resulted in many fewer cans and bottles being dumped35 along roadsides and empty lots36. In fact, many regions organized clubs and groups of concerned citizens “adopted a few miles37” of a highway right of way and provided weekly collection of the waste items thrown there. 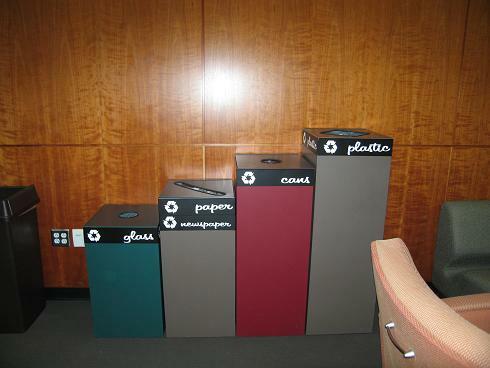 Within the past year or two, most states have been looking for more equitable38 means of recycling cans and bottles. Attempts to force stores to collect cans and bottles have found strong resistance39. Some states, including Iowa, have tried legislation40 to raise the deposit fee to 10 cents per can and require machines at stores where cans and bottles can be recycled. We are in favor of the 10 cent fee, but this is still a controversial41 issue. 1. errands: short trips from home to complete small tasks, such as shopping, mailing packages, etc. (跑腿，差事). 2. pop cans and bottles: containers in which soft drinks are sold (饮料罐/瓶). Such drinks are referred to as pop in the Midwest, but soda in the East. In California the term “coke” often refers to all soft drinks. 3. recycling center: a place where waste items such as cans, bottles, paper or metal may be taken for reprocessing and reuse (回收利用中心，空罐头、空瓶子、废纸或废金属在那里经过处理可以重新使用). 4. plastic garbage bags: very large bags that can contain large quantities of waste items (塑料垃圾袋). 5. deposit: the additional money which one pays when purchasing a beverage in a can or bottle (押金，买罐装或瓶装饮料时额外付的压瓶费). 6. donation: a gift, usually for some charitable cause or organization (捐款). 7. C.O.C. / The Christian Opportunity Center: a private school and residential campus in Pella, Iowa, where mentally and physically disabled persons are trained to function in society, and especially to become self sufficient if possible (基督教机会中心，是派拉的一所私立住宿学校，残疾人在该校接受培训，使他们能够在社会上发挥作用，尤其是有可能成为自食其力的人). This private school serves clients from the entire region and is supported by private contributions and gifts. 8. handicapped: disabled in some manner, either physically or mentally (有生理缺陷的，弱智的). 10. severely: very badly or to a great degree (严重地). 11. non redeemable: unable to be exchanged for money (不能退换钱的). Many juice bottles for which no deposit is required are unable to be exchanged for money. 12. recycle box: a strong, plastic box provided to city residents who pay a monthly fee for use of the box to place recycled items picked up at the front of the residence (回收箱，一种很结实的塑料箱供居民放可回收物品，使用回收箱居民每月要付费). 13. resurgence: the reappearance and growth of something that was common in the past (再现，复苏). 14. “War on waste”: active participation in solving the waste problem for a society or community (解决废物的战争). 16. “Earth Day”: the day set aside by the U.S. government to give attention to improving the environment of the “Earth,” the planet on which we live (地球日，这是美国政府为了改善自己居住的地球环境设定的). 17. littered: scattered widely over a given area (…扔得到处都是). 18. State Legislatures: the governing bodies made up of elected officials which make the laws for the state where one resides (州立法机关，制定所在州法律的机构，其成员由选举产生). 19. City Councils: the local governing bodies for a town or city (市政委员会). 20. wrestled: struggled with, or worked hard to achieve a given goal (费力地处理、解决). 21. monetary incentive: the use of money to make something more attractive or desirable to a person or group (用钱进行刺激、鼓励的措施). 23. waste metal: metal that is no longer needed, is broken, or can be parted with (废金属). During both big wars citizens were urged to donate metal so that it could be recycled into ammunition, weapons etc. 24. Boy Scouts: an organization of boys (童子军). There is also a Girl Scouts organization. 26. modest treasury: a small amount of money that could be used for the activities of an organization (小金库). If enough members turned in recyclable materials, the treasury could build up fast and support numerous activities for the group. 27. win-win situation: an event in which everyone involved gains something positive (双赢局面). In this case, the waste material was disposed of (a winning situation) and the organization received its needed funds for its activities (also a winning situation). This is a popular positive saying at the present time. 28. valid: effective, correct, appropriate, etc. in a given case (有效的，合理的). 29. “throw away society”: the term used to describe a wasteful society or group of people (一次性使用的社会，指非常浪费的社会或群体). 30. wallowing: taking unrestrained delight in something, degraded or degenerate activity (沉湎，沉迷). 31. city ordinances: laws passed by the City Council, pertaining only to that city (市政条例、法规). 33. bear the brunt: take on the burden (承担后果). 34. while flawed: although it was not perfect or with errors (尽管不完美). 35. dumped: carelessly dropped or thrown (丢弃). 37. “adopted a few miles”: took on the responsibility for cleaning up a given area along a roadway (负责几英里的清洁任务). 38. equitable: dealing fairly and equally with all concerned (公平的，公正的). 39. resistance: opposition, objection or unwillingness to participate or to agree with something (阻力). 41. controversial: subject to argument, dispute or disagreement (有争议的). 42. packaging: wrapping, enclosing or covering, as in gift wrapping, etc. (包装). Many of our international friends who come to Pella, or any other area in the United States, tell us that they hesitate1 to walk through areas between houses because they believe that property owners2 will “shoot them”3 or at least object to their walking across private lawns and between houses. Actually, this is a rather unfortunate4 misconception5, and it is another good example of cross-cultural misunderstanding6. In the U.S., homes are built on land which is privately owned, but unless a property is fenced off7, such as a garden, or signs are posted8 saying “No Trespassing9,” or “No Hunting10,” etc. any person has a right11 to walk on private property12 between houses, small stores, etc. In fact, residential building permits13 require that there be at least 15 feet [about 5 meters] between any buildings, stores, etc. except for commercial areas14 where stores and apartments may have adjoining15 walls or smaller spaces. This is done to permit access to fire engines16, water, electricity and gas meters17, delivery of packages, etc. We expect18 to see people walking through our side and back yards if it is the most direct pathway to a destination19. The same is true for bicycles, though it is expected that automobiles do not use this as an alternative20 to paved streets or roads21. It is also true that in most cases, free access22 to public beaches, recreational areas, parks etc. must be provided23 to people walking or even driving to them. Beachfront24 hotels are required by law25 to provide access to the ocean and lakeside beaches, even if it means that people might have to walk through the hotel lobby26 to reach the beach area. It is neither appropriate27 nor lawful28 for persons walking through private yards to damage gardens or fences, litter29 private property, or mistreat30 pets in private yards, etc. We tell our friends to come in through the backyard31 of our home, and that is true with most property owners. If a property owner wishes to exclude32 walkers from their property, they are permitted to have fencedyards33, but they must still leave access to emergency vehicles34, water hydrants35, etc. Of course, when walking through private lawns36, driveways37, etc. a person is not free to examine buildings, yard ornaments38, or to look into windows of adjacent39 homes. These violate40 the principle of free access through private property, and are considered both illegal and unacceptable41 behavior. Pella and other U.S. towns and cities are not “Rome,” but one should feel free to take the most direct path while walking without fear of being injured, scolded44 or shot by doing this. 1. hesitate: wait before doing something; not immediate (犹豫，踌躇). 4. unfortunate: lacking good luck (很不幸). 5. misconception: wrong idea about something, not a fact, misunderstanding (误解，错误看法). 6. cross cultural misunderstanding: not knowing something because it is different in one culture or society from another (不同文化引起的误解). 7. fenced off: closing one’s property from people by putting up a wire, wooden or stone wall (用栅栏隔开). 8. signs are posted: signs are put in a given place, usually where something will be easily seen (设置、安放标牌). 9. “No Trespassing”: a common way of warning people not to come onto the property ( 不准擅自进入). Once such a sign is seen, people will know that they definitely are not welcome there. 10. “No Hunting”: a sign warning people that they definitely are not welcome to hunt on that property (禁止打猎). 11. right: something to which someone has a just claim; the power or privilege to which a person is justly entitled (权利). 12. property: something owned by a person or business, specifically a piece of real estate (财产，特别是不动产). The owner of private property has the right to possess, enjoy or dispose of it, but most of the time does not try to keep others away from it. 13. permits: written permissions granted by someone having the authority to do so (许可证). In most cities and towns a person wishing to build a house or other building must apply for and receive a permit from the city government in order to do so. 14. commercial areas: places where business takes place (商业区). Many buildings are designed as commercial buildings and need special requirements. 15. adjoining: directly connected to one another; touching at a point or line. ; adjacent (相连的，毗连的). 17. water, electricity and gas meters: devices for measuring the volume of water, electricity and gas used over a period of time (水，电，煤气表). 18. expect: suppose or think something will happen (期盼). 19. destination: the place to which one is going; point of the end of a travel or journey (目的地). 22. access: permission, liberty or ability to enter, or approach (进入、接近……的权利). 23. must be provided: always available; must be supplied (必须提供). 24. beachfront: a strip of land next to a large body of water (海滩地区). 25. by law: according to legal documents; may not be denied (按法律规定，根据法律). 26. hotel lobby: the main floor of a hotel where business transactions occur; public area of a hotel (旅馆大堂). 27. appropriate: suitable or according to expectations (合适的，恰当的). 30. mistreat: treat badly or tease; injure (虐待). 33. fenced yards: yards which are surrounded by wooden, wire or stone walls (围上栅栏的院子). 37. driveways: paved areas leading from the street into the homeowner’s garage (私人车道). 39. adjacent: nearby or next to (相邻的). 40. violate: break the law, disobey some rule or standard or conduct (违背). 42. leases: legal contracts giving a person or group a right to use a piece of property, a house, car, or other item. Last week was “Cleanup Week1” in Pella, where we live. There are two Clean Up Weeks, one fall, and one spring in Pella. Normally, one day of every week the Pella waste disposal trucks2 haul3 away garbage from residences to the regional landfill4. Paper, bottles and cans are recycled5 on the same days. Other waste items6 such as electronic and electrical appliances7, old car batteries8, car tires, and waste paints9 are also collected twice a year by a locally sponsored10 program. The collective name for old or worn out items11 is trash12. Americans are finally trashing13 our wasteful habit of throwing old things away14. In 2005, we generated less garbage and recycled more waste15. This was the first time ever that our government has recorded a decline16 in the amount of trash produced. The United States made 245.7 million tons of garbage in 2005, about 1.6 million tons less than in 2004 according to the EPA [Environmental Protection Agency17.] That means an average of about 4.5 pounds of garbage per person per day for our residential families18. That is a good start, and we can probably improve this reduction of waste as we continue to work at recycling. Nearly one-third of our trash was recycled in 2005, and the EPA has set a goal for us to recycle 35% of our trash by 2008. That would be a big change from 1980, when only 10% of trash was recycled in the United States. Kate Krebs, the executive director of the National Recycling Coalition19, a citizen’s organization, has launched20 a comprehensive education campaign21 to teach people what to recycle and where to do it. One of the newest targets22 for recycling; electronic equipment waste, is the fastest growing part of the nation’s trash. In 2005, about 1.5 million to 1.9 million tons of used and unwanted electronics items were discarded23, mainly in landfills. Only 345,000 to 379,000 tons were recycled. The recycling of computers, printers, telephones, cell phones, microwave ovens, etc, as well as rubber automobile tires has recently become a serious recycling effort in the U.S. Automobile tires, used oil (paint), and batteries were previously24 wasted, but now the oil and batteries are recycled, and used tires are ground25 to small pieces and used to build all-weather playing fields for football, running tracks, and playgrounds. Recycling is important to all of us, because it helps prevent greenhouse gas emissions26 and saves energy. The EPA says that our efforts in 2005 saved the energy equivalent27 of 11 billion gallons of gasoline. This is good news to me, and to all Americans, and it should be encouraging28 to other countries throughout the world. Some of these started recycling long before the U.S. took it seriously. My family has two phones, two microwave ovens, an old computer printer and four car tires in our garage. We will soon learn when our local recycling of electronic items, electrical appliances, and car tires are scheduled for this fall season. As the computer experts say, “Garbage in – garbage out.29” It never ends! 1. “Cleanup Week”: a designated week in which waste items may be left out at the street to be carried off by the city trucks to the landfill area (清除废物周，该周内市里派车将置放在路边的废物拉到垃圾填埋场). Actually, some of these articles are still useful, and some people go around the city looking for items they’d like to have, and they pick them up and take them home, or prepare them to be sold as used items. 2. waste disposal trucks: trucks specially provided with parts to load trash and to carry it to the dump landfill (垃圾车). 3. haul: carry something or somebody to some destination (拖运). 4. regional landfill: an area set aside for the disposal and burying of waste materials; often done on a county or multi-county basis rather than for individual cities (地区垃圾填埋场). 5. recycled: collected and used again for another product (回收利用). 6. waste items: things that are no longer useful; i.e. glass, paper, tin cans, etc. (废弃物，如玻璃，纸张，听装罐等). 9. waste paints: unused paint left over which is no longer useable or wanted (剩下不用的油漆). 10. locally sponsored: supported by the city, district, or county (由地方上资助的). 13. trashing: throwing out or discarding; no longer a useful item, so of little value (丢弃废物). 17. Environmental Protection Agency: a U.S. government organization which is given the responsibility for protecting the environment, and for assuring that the public is not endangered by faulty disposal methods (环保局，美国政府机构，负责保护环境以及确保公众不受不正当的垃圾处置方法的危害). 20. launched: has begun, or started on a process or task (发起). 23. discarded: thrown away, got rid of (丢弃). 25. ground: cut or pulverized to very small pieces or a powder-like material (磨碎，碾碎). Today I have a guest blogger1. He is Dr. Kenneth Weller, retired president2 of Central College3. He is a good representative4 of what many of us Americans do after we retire5: we volunteer6 in different ways to help different organizations in which we have an interest. He will now explain his volunteerism7. I am a volunteer guide8. I show people around and explain the working9 of a huge Dutch windmill10. It is a reproduction11 of one built in the Netherlands12 150 years ago. In fact, it was designed and built by descendants13 of a family of millmakers14 who have been fashioning15 mills for four generations16. You may be surprised to learn that although it was built recently in the Netherlands it was taken apart and reassembled17 and now stands where I live in the middle of the United States, in Pella, Iowa. Pella, Iowa, has a strong and continuing relationship with the Netherlands and its people reaching back over 150 years to the first settlers who came directly from the Netherlands to Pella in much the same way that others came to different locations in the US from Africa, Asia, Europe, and all over the world. 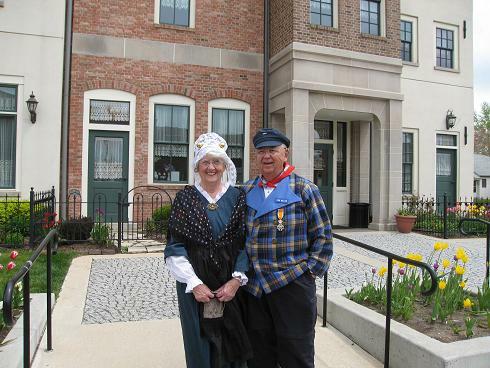 When I show people around Pella’s authentic18 Dutch mill which soars19 high above the highest rooftops, I tell them that it is more than a tourist attraction20; it is a museum. I hope that they enjoy it, but as a museum it also should teach them something about the past that will shed light21 on problem areas22 of today such as immigration management23 and sustainable energy24. As people of Pella25 we acknowledge26 in our museum, our architecture27, our gardens and our customs28 that we are connected with another ancient culture. We offer a symbolic29 way to all Americans as a reminder of their own personal connections30 with some other culture or mixture of cultures that go back many centuries31 and lend meaning to their lives32. As we read in today’s newspapers of our struggles33 with managing immigration, we cannot forget that almost all Americans are the descendants of immigrants, and therein lie both challenge and opportunity34. The same newspapers are filled with concerns for finding environmentally friendly, sustainable sources of energy35. Visitors to the mill will experience in the swishing36 of the arms37 and the rumbling38 of the immense grind stones39 the simple but astounding40 potential41 inherent in42 new adaptations43 of simple ancient methods for capturing power from the wind44. And so, if you are in Pella, Iowa, look for a little old, round man45 with a blue cap and a big smile. I will entertain46 you and challenge47 you to look for wisdom of the past for solving problems of today. But if you don’t plan to come to Iowa, I am sure that if you look around wherever you are, you will find someone else volunteering just like me. 1. guest blogger (特邀写博客者): a person who does not usually write blogs, but who has written this blog because he knows the details and is willing to share them. 2. president: the chief administrative officer of a college (校长). 3. Central College: a small liberal arts college located in Pella, Iowa. 4. representative: a person who speaks for or serves as an example of a larger group (代表). 5. retire: leave a place of employment or a career after having served for a given period of time ( 退休). 6. volunteer: offer one’s time or service to help in some activity or endeavor (做义工). 8. volunteer guide: one who leads a group through a tour of a place, a museum, etc. without being paid to do so (义务导游). 9. working: the way something such as a system, piece of equipment, or organization works (运行、工作方式). 10. Dutch windmill [荷兰风车(磨)房]: a type of wind driven set of machines designed in the Netherlands by Dutch people who specialize in constructing these machines which may produce power to do jobs such as to grind grain, pump water, produce electrical power, etc. 11. reproduction: an exact copy of another thing, i.e. 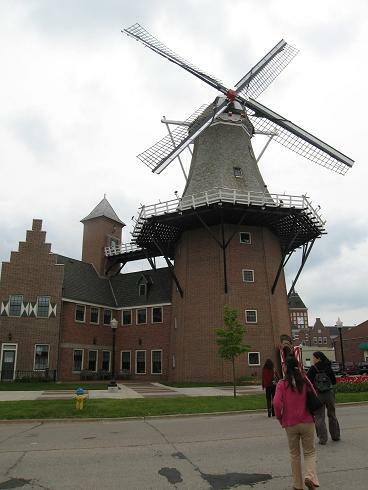 in this instance, a windmill copied from a preexisting windmill in the Netherlands (仿制品、复制品). 12. Netherlands: the country, also called Holland, where the residents are called Dutch (荷兰). 13. descendents: people who have come from a direct line of ancestors (后裔、后代). 14. millmakers: workmen who are skilled in the making of windmills (风车房制造者). 15. fashioning: shape or make something, using your hands or only a few tools (手工制作). 17. reassembled: put together again from pieces which had previously been part of a whole (重新组装). 18. authentic: genuine or real (地地道道的). 19. soars: flies or glides in the air, or is located high above the ground (高耸). 20. tourist attraction: something which draws the attention of tourists (吸引旅游者的景点). 21. shed light (on): make something easier to understand, by providing new or better information (使……更容易理解). 22. problem areas: things which cause difficulties or challenges for a group of people or a nation, etc. (存在问题的方方面面). 25. Pella: the name of a city in south central Iowa, founded by a group of immigrants from the Netherlands about 1846 (美国爱荷华州中南部的一个城镇). 27. architecture: a specific type or style of building pattern or design of houses, etc. (建筑风格). 28. customs: practices of a given group of people; the way in which a group behaves in expressing their cultural heritage (风俗习惯). 29. symbolic: characterized by exhibiting or using ways that are representative of a group (有象征意义的). 33. struggles: difficulties or problems which people must deal with. 34. therein lie both challenge and opportunity: challenge and opportunity come from the situation (that almost all Americans are the descendants of immigrants) [(几乎所有美国人都是移民的后代，) 挑战和机遇都是由此而产生的]. 36. swishing: a noise associated with the movement of something through the air (嗖嗖的声音). 37. arms: the sails or the extended flat portions of a windmill which catch the movement of the wind, and thus are rotated (风车的转动臂). 38. rumbling: the loud, low pitched noise of machinery or other items being moved about (隆隆声). 43. adaptations: small changes made in something (变化，改变). 45. round man: a colloquial way of indicating a fat person, or a person who is rather wide, but not very tall (圆滚滚或矮墩墩的男人). 46. entertain: furnish or show something of interest to another person or persons (接待). 47. challenge: cause another person to respond to something said or asked (提问，盘问). This past week Don and I have been participating1 in a community service program2 known as “meals on wheels3.” As volunteers in this program we have been delivering noontime meals to elderly people who can no longer easily prepare them4 for themselves. Some of them are even confined to5 wheel chairs6. The food is prepared7 in the kitchen of the Pella Community Center8. There is always a hot dish, such as chicken or roast beef, and a cold dish, such as fruit or a salad. The food is put in plastic containers9 and placed in big thermal bags10 which we pick up. There are also small containers of milk that go in with the cold food. We are given names and addresses of the people to whom we are to deliver11 the food and even are told if we should just walk into the house after knocking12 (in situations where the people can’t move fast, or at all13.) We had nine people to deliver to in our group and it took us about an hour to complete the deliveries14 each day. We are told that the food is good, and we know the elderly people appreciate15 it and our delivering it. They keep saying so. The cold box usually contains a sandwich16 which they can eat in the evening. That way they really are sure to have two meals each day. Some of the people see no one else other than the meal deliverers each day17, so they are eager for a little conversation18, and they often like to ask about the weather. Today I could tell them that it was lovely, sunny and cool. Yesterday I told them how windy and rainy it was. No matter what19, they are always interested. The program of food deliverers is organized through the local churches. When it is our church’s turn, volunteers are asked for, and if we are in town we volunteer20. It’s an activity that always makes us feel good, and we know it is both useful and appreciated. l. participating: taking part in along with other people (参加). 2. a community service program (社区安排的服务项目): an activity provided by the community in order to provide a needed item or items for some specific group, i.e., the elderly, within the city or area. 5. confined to: If someone has to be confined to a wheelchair, bed, or house, etc., they have to stay there because they are disabled or ill.
6. wheelchairs (轮椅): sturdy chairs with wheels for people who cannot walk, or walk poorly. 7. prepared: put together, cooked, or made ready beforehand . 8. Pella Community Center (佩拉镇社区中心): a building provided by the city of Pella which serves as an area for community offices, recreation, art exhibits and other services to people living in the community. 9. containers (容器): box-like receptacles for holding items such as food or other items. 10. thermal bags (保温袋): large portable, insulated plastic containers which keep food or other materials hot or cold for a period of time. 11. deliver (递送、投递): take one or more items to a specific location or address. 15. appreciate (欣赏、感激): feel grateful or thankful for, enjoy something. 18. eager for a little conversation: wanting very much to have a little conversation (非常想聊一点天). 19. No matter what: No matter what the weather is (不管是什么天气). You are currently browsing the archives for the Small Town Life category.